Living From the Center Within is a highly engaging, interactive, informative and accessible journey toward higher consciousness. Moving from personal pain and lacking to abundance and wholeness is possible. Living From the Center Within helps readers center, quiet and open the mind-body-heart. Using the wisdom of ancient teaching and modern science, invitations to daily transformative practice and reflection questions, Rae walks readers through three levels of human consciousness. Expanding awareness, focusing attention and clarifying intention brings people to their center within. Living from one’s true nature amplifies creativity and benefits the personal and professional life. It also has collective impact culturally, politically and economically as people become more effective at service, relationships, and work. Living From the Center Within explains how minds, bodies, and emotions are intertwined and gives the reader tools to move toward a healthier self. It is for people eager to actualize their beings and fall in love with their lives. You can live full out and fearlessly from a sense of calm, joy, and peace. With increased awareness, we naturally shift toward transparency, compassion, tolerance and interdependence. Now is the time for humanity to claim a higher level of consciousness for personal and communal growth. Michele Rae has crafted a recipe for the times. Drawing from her extensive education, personal growth, and credentialed world experience, she has extracted the mystical beating heart of all religions, healing ways, and sacred philosophies. From this she has managed to keep intact hundreds of different languagings and systems of understanding and distill them into a concise, complete, and abbreviated path for today’s seeker. For all who would improve their life, the life of the greater community, and that of the planet- this is the go-to book and a must read. Whether you are just dipping your first toe, or have been swimming for decades, in the deep waters of personal transformation and consciousness evolution, Living From the Center Within has something for you. Ms. Rae concocts an enjoyable blend of scientific framework, wisdom perspectives, and practical exercises for personal exploration that will delight and expand the mind of any reader. From the beginning of Living from the Center Within, the reader is in the hands of a knowledgeable, experienced teacher. A true wise woman, Michele Rae has an extraordinary ability to translate material from multiple disciples with clarity. Both an intuitive mystic and a serious student of multiple sciences , she successfully builds bridges between aspects of consciousness. I will be recommending this book to students, clients, and friends. 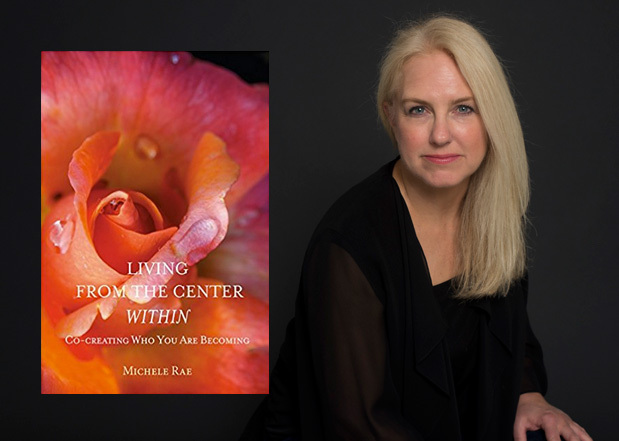 Michele Rae skillfully condenses the stages of conscious evolution into individual, interconnected, and infinite consciousness. With each leap in consciousness there is a corresponding boon to the individual and culture. Michele Rae is a synthesist, a deeply compassionate human being, a transformation artist, and a master at operating from a place of light and inspiration. Living from the Center Within creates an embodied experience of the transformation toward higher conscious that Rae describes. She presents a solid synthesis of what we know from the fields of neuroscience, mind-body science, and consciousness studies. But it is in the gentle unfolding of her process that we experience a glimpse of what it means to live from a place of interconnectedness or even an infinite, pure awareness state. –Cindy Wilcox, Executive Coach, Target Corporation. Living from the Center Within is about living consciously, deeply, authentically. In short, it is an invitation to awaken to true self. Let this profound book be a guide for a journey that is simultaneously one of the simplest and most complex of our lives. Michele is a gifted writer, storyteller and spiritual teacher. Living from the Center Within is a brilliant synthesis of science and ancient wisdom that guides you on a deep and profound spiritual journey as you are invited to encounter ideas and beliefs that may challenge your thinking and expand your consciousness and worldview. Throughout the book, there are multiple “invitations to practice” that offer the reader opportunities for self-discovery as well as exploration of who we are becoming individually and collectively within our families, communities and institutions. The book ignites a spirit of wonder and curiosity. Mary Jo Kreitzer PhD, RN, FAAN – founder and director of the Center for Spirituality & Healing at the University of Minnesota, and author of Integrative Nursing. I could almost feel Michele taking me by the hand and leading me to a deeper understanding and awareness that will have a profound impact on me both personally and professionally. Michele Rae is one of those authors whose gifts include the capacity to enlighten and transform her readers lives.…offers a wealth of fresh material, together with insightful commentary. What I found most remarkable is that the book is capable of resonating on many levels of personal development (hard to do!). That fact likely speaks to Michele’s many years of creating openings to learn for people at many stages of human development. What a wonderful way to focus our efforts at the metaphysical level to measures of success at such a granular level. Our insights here will continue to validate the spirit/mind/body connection more broadly. It will drive more intentional efforts by all of us. A call to action during this time of rapid change and shifting paradigms, inviting each of us to access and express our highest potential in everyday living. Michele Rae clearly illuminates the strength of transformative practices and the mind-body science behind relaxation, intention and attention. This book combines the loving wisdom of the Dalai Lama, the generous kindness of Mother Teresa, and the brilliant insights of Deepak Chopra. It would be a stroke of genius – and necessity – to make Living from the Center Within part of the core curriculum of every K through 12 school in America.